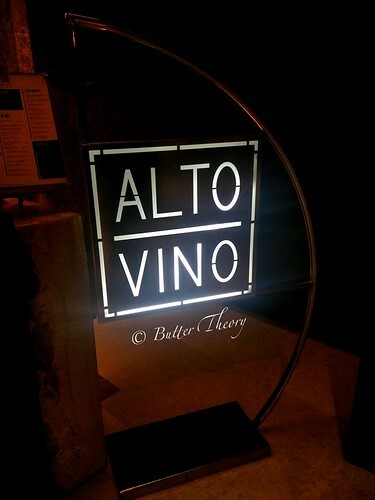 Alto Vino is an Italian Fine Dining Restaurant in Bengaluru Marriott Whitefield, a premier five-star destination. 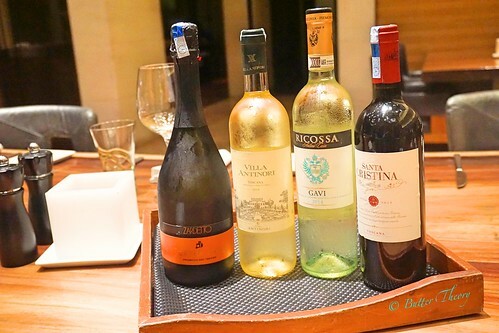 Alto Vino was hosting Sommelier Viraj Sawant during the last week of August and they invited a few food bloggers and journalists. 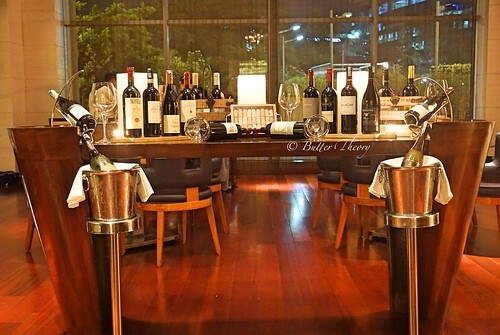 Viraj Sawant is the Brand ambassador/ Sommelier for Berkmann wine cellars India. Prior to this he has held a Head sommelier position in London at one of the Michelin 1 star restaurants, La Trompette, managing a wine list of over 600 bins. He practiced the art of wine pairing in London for 4 years & was earlier instrumental in the selection & pairing of Wines & Food at Veraswamy Park & Coworth Park at Ascot, both being Michelin 2 Star restaurants. 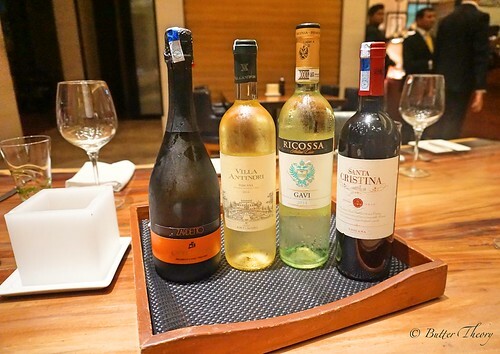 Viraj is currently the only Advance Sommelier in the country and is preparing to be India’s first Master Sommelier, which is the top level of the Sommelier trade!! The three part exam covers all regions of the world at a level that only 230 people have attained in its 40+ years of existence. 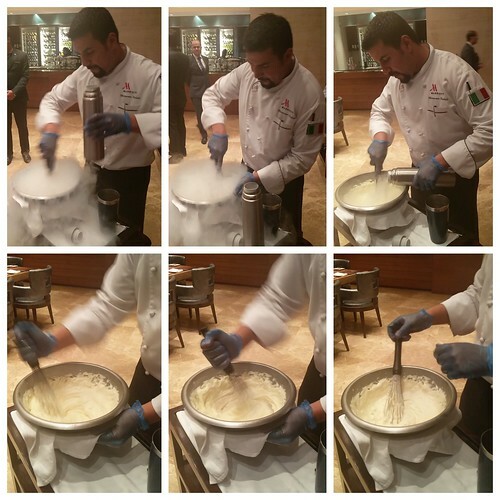 Viraj was here to demonstrate the art of pairing wine with Italian food. 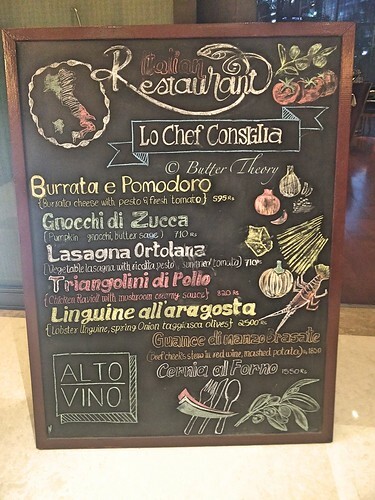 He teamed up with the Head Italian Chef at Alto Vino, Chef Marouane Rahali, also called Marou, to create a delightful dinner menu for us! 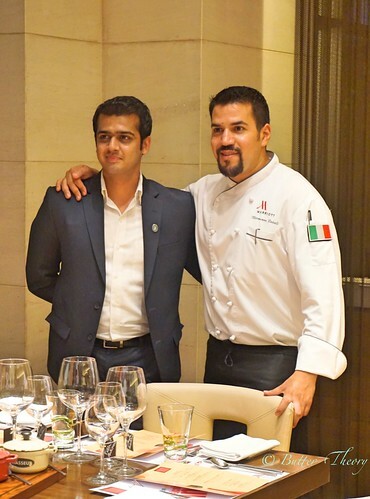 Sommelier Viraj(L) and Chef Marou(R)! 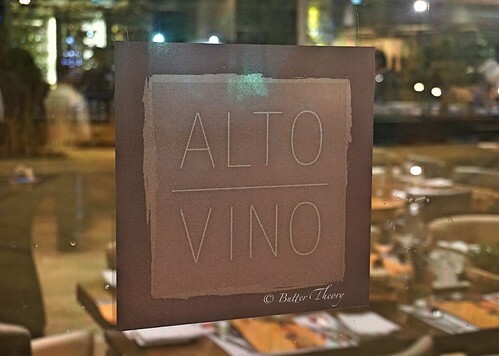 Alto Vino is a sophisticated fine dining restaurant and the interiors exude elegance. 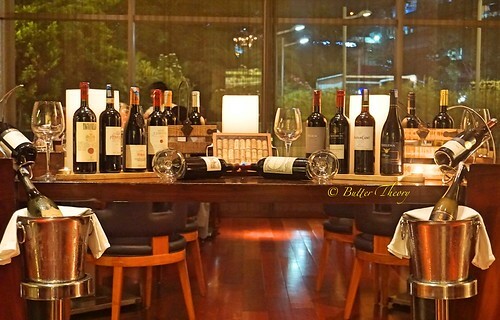 At the entrance, there was a table that showcased some of the best wines that Marriott has to offer! 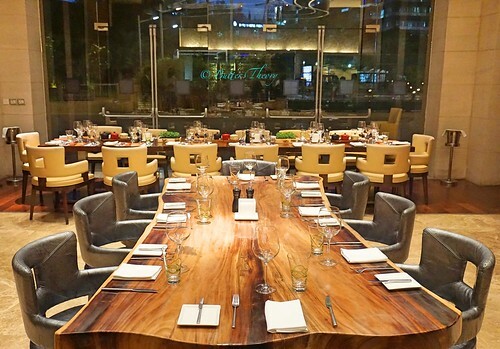 Trendy marble flooring and formal wooden furniture with easy-on-the-eyes colors throughout the restaurant. The table with all the cutlery and glassware on it looked spectacular. 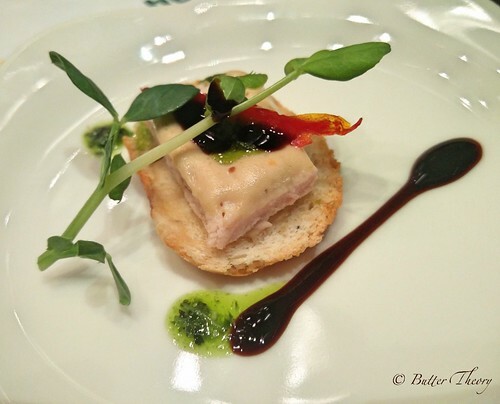 Amuse bouche is a bite sized dish that’s served before the actual meal starts. 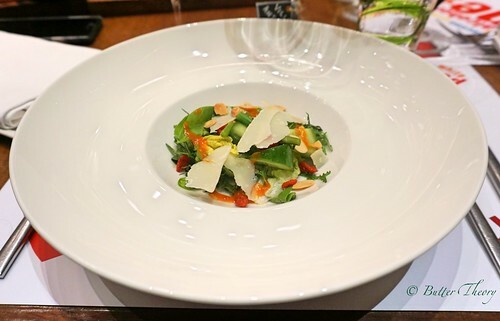 According to Jean-Georges Vongerichten, a popular New York celebrity chef “The amuse-bouche is the best way for a great chef to express his or her big ideas in small bites”. 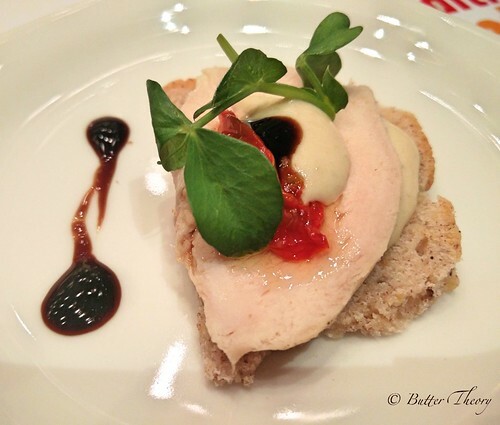 We had a chicken bruschetta, which was also served on a gluten free bread for me! 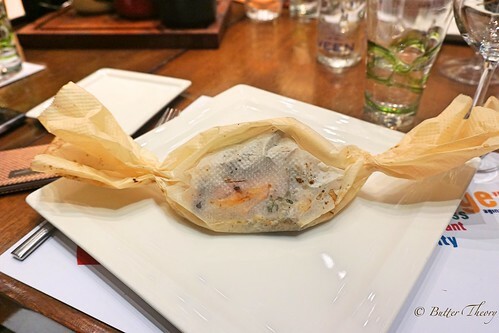 Some of the noteworthy appetizers that were served were Fritto Misto( fried calamari,shrimps dish ) , Strudel di Parmigiana(Eggplant Strudel) and a gluten free herbed chicken. 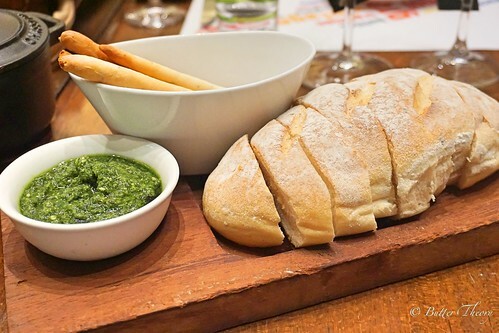 The appetizers were paired with the ZARDETTO PROSECCO Doc Extra Dry. These are the best known types of Prosecco in the world. It is simple, fragrant and light. It is also perfect as an aperitif. 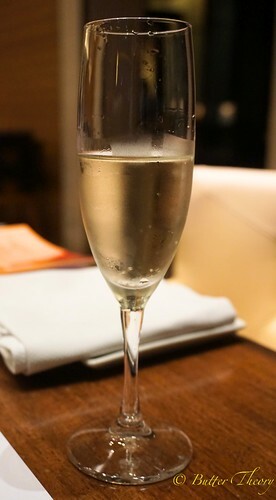 It’s a Sparkling wine from Veneto. Lighter fruitier. Premier and softer. The notes are Peach, Apricot and lime at the backdrop. This goes really well with fried and fatty food. 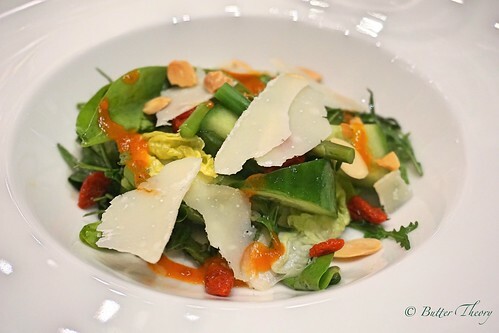 An organic greens salad with goji berry, cucumber, toasted almonds, asparagus, tomato confit and raspberry vinaigrette. Chef Marou says Goji berries open your mind 🙂 as they’re packed in vitamin A & C, fiber, iron. They’re also high in anti-oxidants and are complex carbs. The salad was just the way to start what was an going to be an exceptional evening! 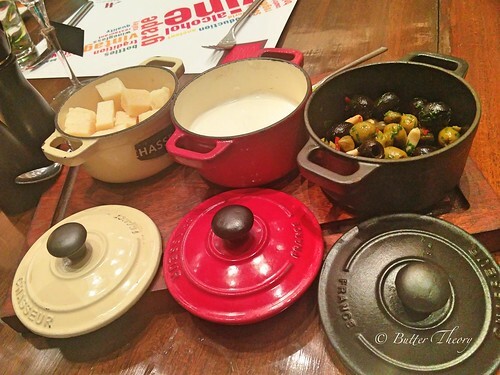 The anti-pasti was paired with the Villa Antinori bianco, Tuscany, Italy. This is a light crisp and fresh, almost like a summer breeze type of wine from the Antinori stable. It is a blend of trebbiano, malvasia, pinot bianco, pinot grigio. This is a wine from the lower side of hills which has a warm climate. The notes are those of Peach, Stonefruit, Citrus, green apple. 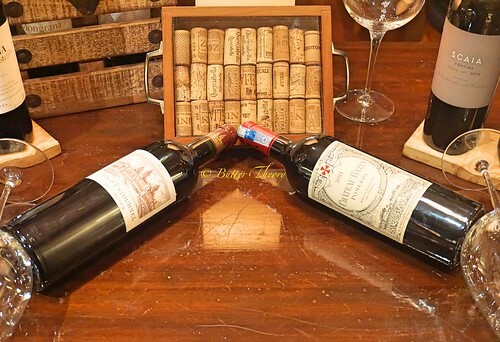 It is considered to be a leaner style of wine. 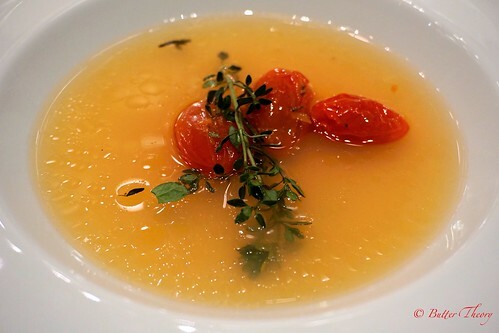 This is a tomato consomme with green asparagus tortellini. 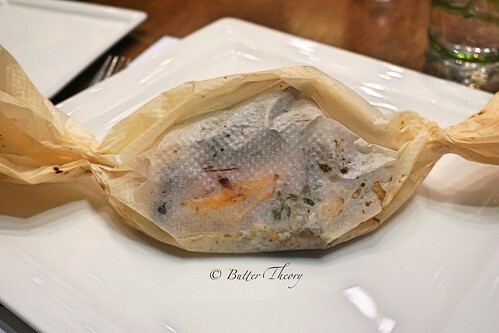 It was clear and packed with flavors! 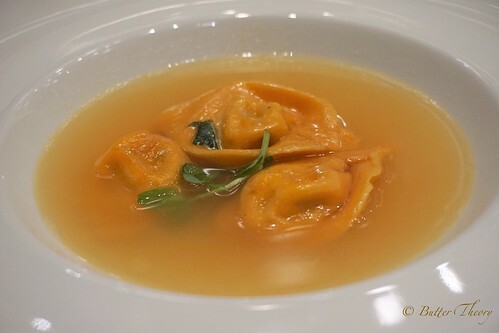 There was an option of tortellini which was was replaced with sun-dried tomatoes for me 🙂 This for me was the most flavorful course of the night! Secondi is the second course of a meal which are usually only protein ( meat and fish ) dishes that could be equated to a main course. 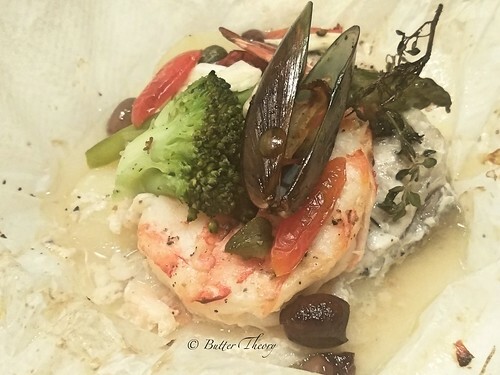 Marinated Seabass and seafood baked in a parchment paper. 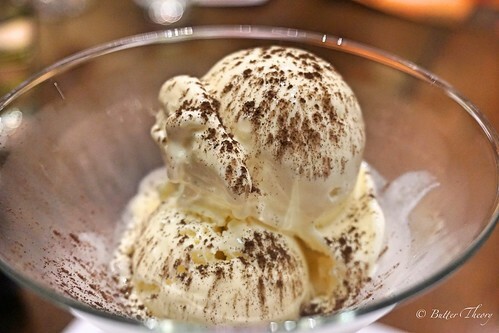 A very refreshing dish with a lot of drama created around the way it was presented! I quite liked the subtle flavors of the seafood and the meat was cooked perfectly. 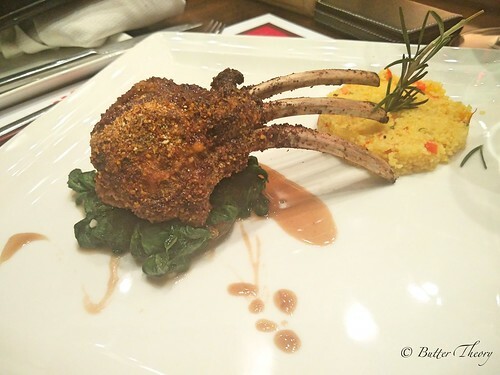 Herb crusted marinated Australian prime lamb shank. It was slow cooked with couscous, sauteed, spinach dry raisins in a jus reduction. It was served with saffron risotto and winter veggies! There were 2 choices for the pairing. The white meats were paired with the white wine and the red meats with the red wine. 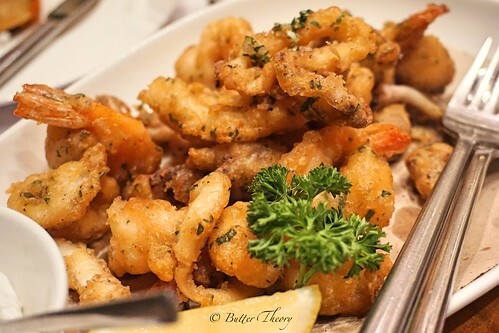 The Seafood was paired with Ricossa Gavi DOCG, Piemonte, Italy. This is wine from a much cooler part of Italy, which is Piemonte. Vineyards on hill slopes, so a perfect balance of ripeness from the sun exposure and lean mineral acid back up due to cooler nights. This wine is very subdued and restrained if compared to the first one, it needs a few minutes to open up in the glass. It shows a lot of minerality(taste as if of licking wet stones and often a chalky texture to match) on the nose and the palate, with candied citrus and flintyness. It also shows a bit of bready complexity still holding the bright acid. 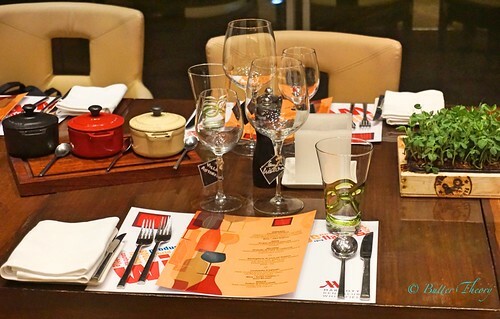 The lamb shank dish was paired with Marchesi Antinori,Santa Cristina IGT, Tuscany, Italy. The only red to be put out, but nevertheless it was shining star. 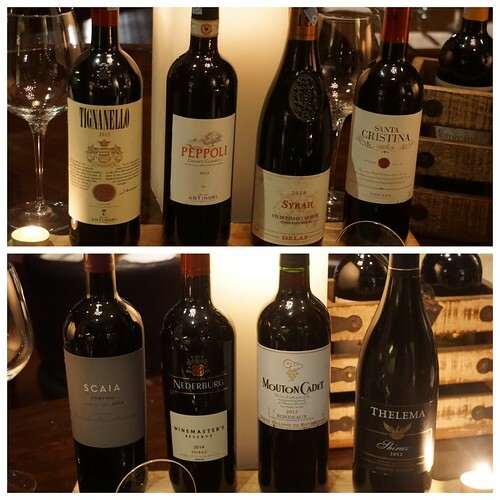 This wine is a gateway to all the Antinori greats. Blend of Sangiovese and cabernet sauvignon & syrah. The sangiovese in it makes it bright and crisp, with raspberries and sour cherries followed by balsamic and eucalyptus. With some time in the glass it shows its savory side of meatiness, earthiness yet quite supple. It is a wine of much drinking pleasure. 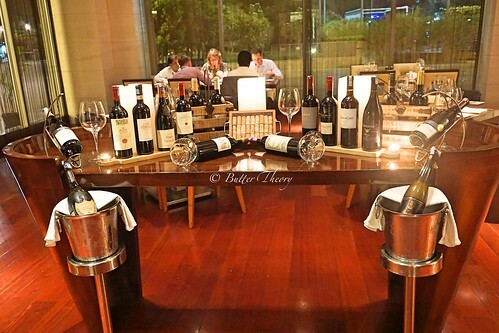 The event was of absolute importance to me as it gave me an insight into the right pairing of wines. Viraj was very helpful in answering all my queries around wines. I would always stick to the regular Shiraj, Merlot and Sauvignon, but now I’ve become slightly more knowledgeable about the various wine families. I would like to point out that the staff here was the most aware of the dishes than I’ve ever seen anywhere else. 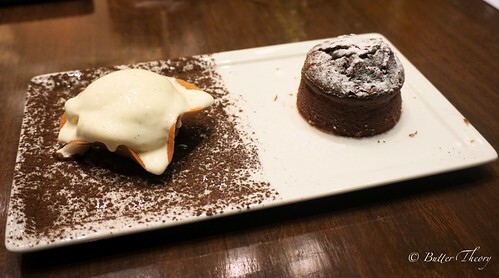 There was this one particular staff member who knew intricate details of the dishes that were served to us, to the point that he made sure I never got a dish with gluten in it! Chef Marou is doing a fabulous job at making the guests feel at home by spending time with them understanding their likes and dislikes before placing an order!! Nick Dumbell, the GM of Bengaluru Marriott Hotel Whitefield was very sportive and joined us for a few minutes. We also met Kadambari Sabharwal Talwar, Market Director Sales and Marketing, Marriott Mumbai who was in Bangalore for a brief period of time! 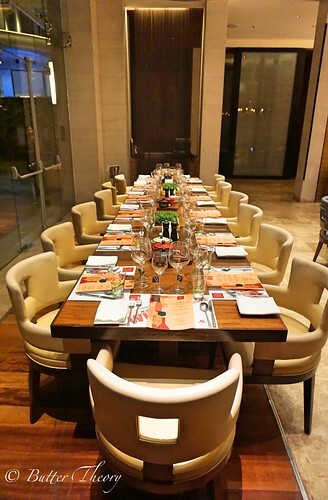 Special Thanks to Siddharth Verma, Manager in Marketing Communications for Bengaluru Marriott Hotel Whitefield and Vaishnavi, Rejoy and Priyam from The PRactice, a PR firm for playing the perfect hosts for the evening.